TNM has been released. Its a mod which has been in development for 7 years. Its a compleate total convertion which features voice overs for every line of dialog that the npc's say. See http://www.thenamelessmod.com for media + downloads. In Forum City, the Internet is serious business. As its name implies, the city is the physical embodiment of Internet forums and bulletin boards. It's more like The Matrix or Tron than Second Life, however, as the troubles of the city are no laughing matter. Embracing the style of Deus Ex, Forum City has as much crime and conspiracy as the world of JC Denton — but most citizens would have it no other way. The lust for power seems to come easily to those who call the city their home; everywhere there are factions scheming to increase their reach, or even wrest control of the city itself. Were it not for a peacekeeping triumvirate of invulnerable Moderators the city would quickly plunge into chaos. This has been the way of things for as long as most care to remember. But now, the balance of power has been upset. Unthinkably, a Moderator has disappeared, and panic is gripping the city. With the remaining Moderators spread far too thin, the lawless have found themselves with the freedom to prey upon others, and formerly suppressed rivalries threaten to explode into open conflict. You are called upon to silence the discord. 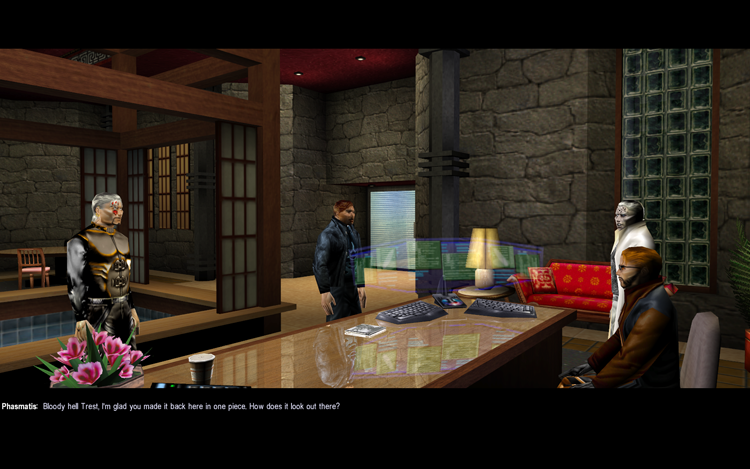 Throughout the course of the game, you take on the avatar of Trestkon, a former intelligence agent whose reasons for leaving the city are mysterious, at best. Negotiating for his return was an act of desperation, but having known him personally, the remaining Moderators trust that he can find their missing colleague before it is too late. Two years can change a man, however, and Trestkon's loyalty is not set in stone. Now imbued with legal authority, he could tip the balance of power in virtually anyone's favour, and the multitude of factions are well aware. Corrupt corporations, religious fanatics, cyber-terrorists, and even deadly computer programs will stop at nothing to gain Trestkon's allegiance. To the casual observer, The Nameless Mod may appear to be a self-indulgent piece of fan fiction about inside jokes on a forum. Well, you got us, that's how it started. It didn't take long to realize that the target audience for something of that nature would be incredibly small, and would grow smaller as development went on. Thus, The Nameless Mod has outgrown its roots as a silly in-joke to a complete game with a complex story and memorable characters. In general, the setting remains the same — a virtual world representing an Internet community — but it's a setting that's approachable for anyone who has spent time with a computer. If that's not you, congratulations on finding the power button, you're on the road to success! Of course, TNM is not devoid of humour; everyone can enjoy the subtle (and not so subtle) references to online culture and pop culture, and if you've got a brain, even better! The point is, The Nameless Mod has something for just about anyone, and if you don't believe that a mod that started out as self-referential fan fiction can achieve that, give it a spin, it's free!